Britain Warns Moscow Over Poisoning Of Ex-Russian Double Agent : The Two-Way Sergei Skripal, a retired Russian intelligence colonel living in exile in the U.K. following his conviction in Russia on espionage charges, suddenly fell ill from an "unknown substance" on Sunday. 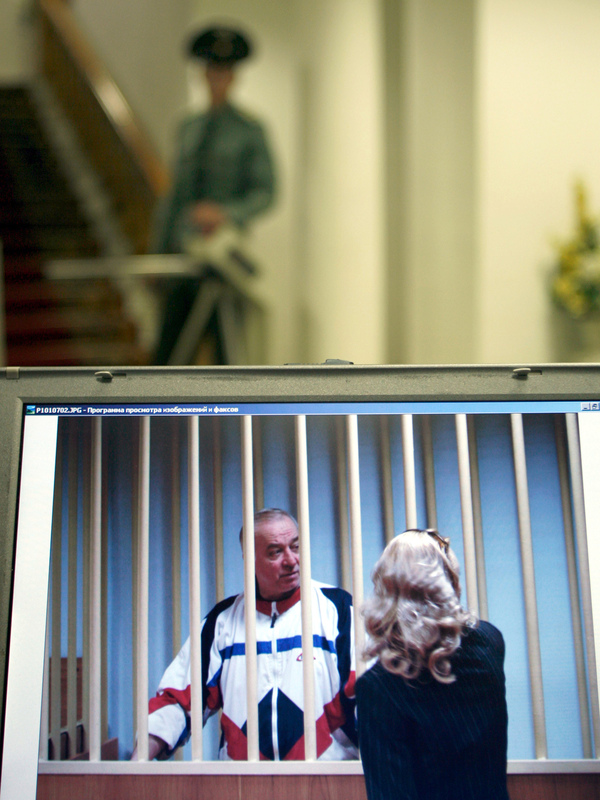 A monitor outside a courtroom shows Sergei Skripal speaking to his lawyer from behind bars in Moscow in 2006. Skripal is a retired Russian colonel recruited by British intelligence in the mid-1990s. Britain's foreign secretary has warned that the U.K. will respond "appropriately and robustly" to Moscow if it is found to have been involved in the mysterious poisoning of an ex-Russian spy who suddenly fell ill in southern England over the weekend. Sergei Skripal, a retired Russian intelligence colonel living in the U.K., was found collapsed on a bench along with his daughter, 33-year-old Yulia Skripal, in a Salisbury shopping mall on Sunday. Authorities say the two, both in critical condition, were exposed to an "unknown substance." The incident has drawn comparisons to the 2006 death of Alexander Litvinenko, a former officer of the FSB domestic intelligence branch and an outspoken critic of President Vladimir Putin who defected to the West. Litvinenko died in Britain after exposure to the radioactive isotope Polonium-210. In 2016, an investigation concluded that he was "probably" killed on orders from Putin. Foreign Secretary Boris Johnson, speaking in the House of Commons, said he was not "pointing fingers" but addressing lawmakers referred to "echoes of the death of Alexander Litvinenko in 2006." "I say to governments around the world that no attempt to take innocent life on U.K. soil will go either unsanctioned or unpunished," he said. Russian Foreign Ministry spokeswoman Maria Zakharova called Johnson's remarks "wild." As we reported on Monday, in 2006, Skripal, 66, "was jailed for 13 years after he was convicted of handing over to MI6 the identities of Russian spies working undercover in Europe during the 1990s. Russian prosecutors charged that he had taken tens of thousands of pounds from the British spy agency." Skripal was released in 2010 as part of a prisoner swap with Moscow and had reportedly been keeping a low profile in Salisbury since then. British counterterror specialists were reportedly lending expertise to police investigating Skripal's case. According to the BBC, scientists at the U.K.'s weapons lab known as Porton Down were studying the "unknown substance" thought to have been involved. Metropolitan Police Assistant Commissioner Mark Rowley, in an interview with the BBC, also drew parallels to the Litvinenko case. "I think we have to remember that Russian exiles are not immortal," Rowley said. "They do all die and there can be a tendency for some conspiracy theories," adding "[We] have to be alive to the fact of state threats as illustrated by the Litvinenko case." 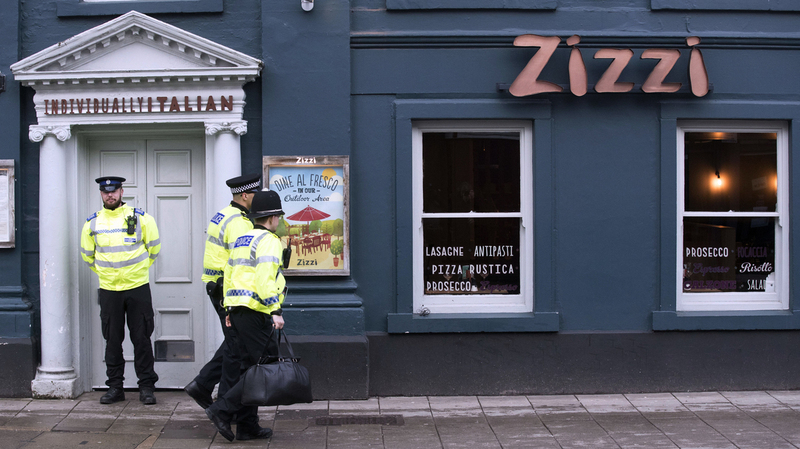 Police outside an Italian restaurant in Salisbury, England, on Tuesday, near to where former Russian spy double agent Sergei Skripal and his adult daughter were found critically ill Sunday following exposure to an "unknown substance." The Guardian newspaper reports that "[The] bench where the pair collapsed unconscious in the Maltings shopping centre next to the river Avon remained cordoned off, as was a Zizzi restaurant, which police said had been shut as a precaution. Wiltshire police revealed a third premises nearby, the Bishop's Mill pub, had also been sealed off." The Associated Press quoted the manager of a nearby gym as saying that police were interested in closed circuit video of a man and woman walking through an alleyway near the restaurant. "Police had a good look at the footage and were interested in these two people. It was the only image they took away," the manager, Cain Prince, told the AP. "They wanted a list of everyone in the gym between 3 p.m. and 4 p.m. as well." The apparent poisoning of Skripal and his daughter comes after other suspicious or untimely deaths in the family. "His wife Liudmila died in 2012, a year after they had bought a semi-detached home in Salisbury. Two years ago, Col. Skripal's older brother died in Russia, and last year, his 43-year-old son died while on holiday with his girlfriend in the Russian city of St. Petersburg. He had been rushed to hospital with liver failure."